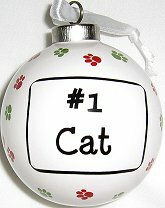 A very special cat deserves recognition as #1. This ornament says it all. Made of glass and plastic, the ornament is 2 3/4" in diameter. Red and green paw prints cover the ornament. Ribbon loop for hanging.